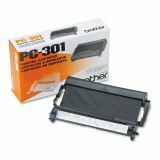 Brother PC-301 Thermal Transfer Print Cartridge, 250 Page-Yield, Black - Thermal transfer cartridge is designed for use in Brother intelliFax-750, intelliFax-770, intelliFax-775, intelliFax-775SI, intelliFax-870MC, intelliFax-875MC, intelliFax-885MC, and MFC-970MC. Cartridge yields approximately 250 pages. Brother warrants to you for the Warranty Period that there are no defects in the materials, workmanship or Year 2000 compliance of this Product. What is NOT covered: This warranty is VOID -- that is, this Product has no warranty -- if: (1) you did not purchase this Product from an authorized Brother reseller within the United States, (2) this Product has been serviced, modified or tampered with by anyone other than an Authorized Service Representative of Brother, (3) the serial number has been modified, defaced or removed from this Product, (4) this Product has been abused or damaged, or, the recommended monthly volume has been exceeded, (5) non Brother?-brand or non Brother approved parts, supplies, power supplies or other accessories have been used with this Product, or (6) this Product has been transported without the proper preparation and packaging. THIS WARRANTY IS GIVEN IN LIEU OF ALL OTHER WARRANTIES, WRITTEN OR ORAL, WHETHER EXPRESSED BY AFFIRMATION, PROMISE, DESCRIPTION, DRAWING, MODEL OR SAMPLE. ANY AND ALL WARRANTIES OTHER THAN THIS ONE, WHETHER EXPRESS OR IMPLIED, INCLUDING IMPLIED WARRANTIES OF MERCHANTABILITY AND FITNESS FOR A PARTICULAR PURPOSE, ARE HEREBY DISCLAIMED. This Limited Warranty is the only warranty that Brother is giving for this Product. It is the final expression and the exclusive and only statement of Brothers obligations to you. It replaces all other agreements and under-standings that you may have with Brother or its representatives. This Limited Warranty (and Brothers obligation to you) may not be changed in any way unless you and Brother sign the same piece of paper in which we (1) refer to this Product and your bill of sale date, (2) describe the change to this warranty and (3) agree to make that change.